The area where the lower end of the esophagus meets the upper part of the stomach is called the gastroesophageal junction. Cancer of the gastroesophageal junction has become more common in recent decades. 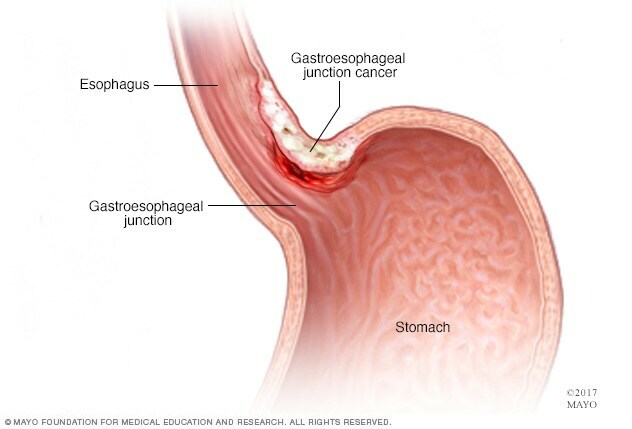 Cancer of the gastroesophageal junction develops in the area where the esophagus joins the top part of the stomach. 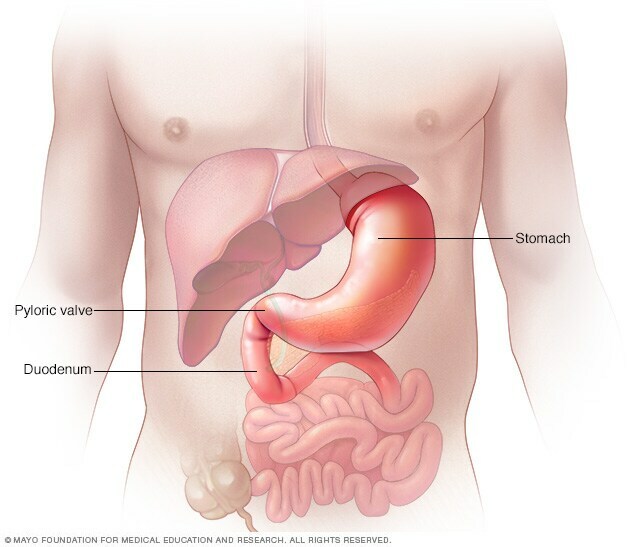 Stomach cancer most commonly begins in the cells that line the inside of the stomach. Stomach cancer usually begins in the mucus-producing cells that line the stomach. This type of cancer is called adenocarcinoma. For the past several decades, rates of cancer in the main part of the stomach (stomach body) have been falling worldwide. During the same period, cancer in the area where the top part of the stomach (cardia) meets the lower end of the swallowing tube (esophagus) has become much more common. 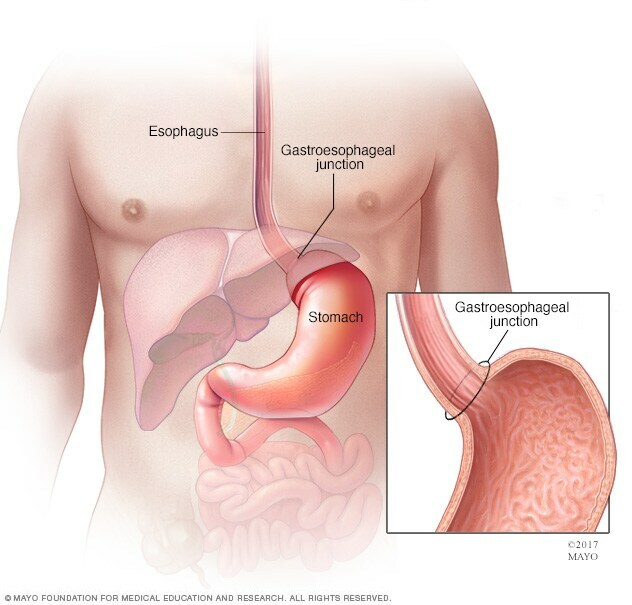 This area of the stomach is called the gastroesophageal junction. Your stomach is a muscular sac about the size of a small melon that expands when you eat or drink to hold as much as a gallon of food or liquid. Once your stomach pulverizes the food, strong muscular contractions (peristaltic waves) push the food toward the pyloric valve, which leads to the upper portion of your small intestine (duodenum). In general, cancer begins when an error (mutation) occurs in a cell's DNA. The mutation causes the cell to grow and divide at a rapid rate and to continue living when a normal cell would die. The accumulating cancerous cells form a tumor that can invade nearby structures. And cancer cells can break off from the tumor to spread throughout the body. 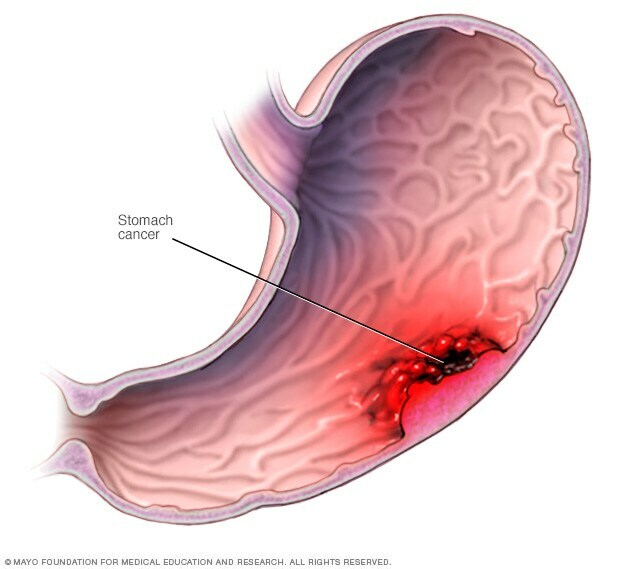 Gastroesophageal junction cancer is associated with having gastrointestinal reflux disease (GERD) and, less strongly, with obesity and smoking. GERD is a condition caused by frequent backflow of stomach acid into the esophagus. There is a strong correlation between a diet high in smoked and salted foods and stomach cancer located in the main part of the stomach. As the use of refrigeration for preserving foods has increased around the world, the rates of stomach cancer have declined. The main risk factors for gastroesophageal junction cancer are a history of GERD and obesity. Exercise. Regular exercise is associated with a reduced risk of stomach cancer. Try to fit physical activity into your day most days of the week. Eat more fruits and vegetables. Try to incorporate more fruits and vegetables into your diet each day. Choose a wide variety of colorful fruits and vegetables. Reduce the amount of salty and smoked foods you eat. Protect your stomach by limiting these foods. Stop smoking. If you smoke, quit. If you don't smoke, don't start. Smoking increases your risk of stomach cancer, as well as many other types of cancer. Quitting smoking can be very difficult, so ask your doctor for help. Ask your doctor about your risk of gastroesophageal junction or stomach cancer. Talk with your doctor if you have an increased risk of gastroesophageal junction cancer or stomach cancer. Together you may consider periodic endoscopy to look for signs of stomach cancer.